The Voivodeship Administrative Court in Warsaw in its judgment of 29 September 2009 case file VI SA/Wa 211/09 held that the prerequisite for registration as an industrial design is the recognition that there is the “appearance of the whole or a part of a product”, and therefore the subject of the application is visible on the outside. This assumption was based on the provisions of Article 102(1) of the Polish Act of 30 June 2000 on Industrial Property Law – IPL – (in Polish: ustawa Prawo własności przemysłowej), published in Journal of Laws (Dziennik Ustaw) of 2001 No 49, item 508, consolidated text on 13 June 2003, Journal of Laws (Dziennik Ustaw) No 119, item 1117, with subsequent amendments. The conditions of novelty and individual character should be examined later. An invisible item, hidden from the visual perception of the buyer, or the “end user” (consumer) does not constitute an industrial design. It does not have a form of “a product” which meas its appearance. It’s not about the appearance of the component of a product which is visible after separated from the whole, but it is about the possibility to get visually acquainted with it when you buy it, and especially – during the so-called normal use. 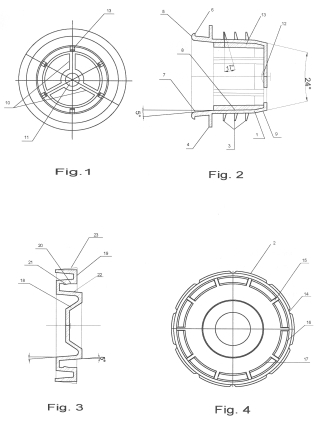 This case concerned the industrial design “Ogranicznik wylewu” (in English: overflow limiter), Rp-9737. See also “Polish regulations on industrial designs” and “Polish case law on industrial designs“. Categories: appearance of the whole or a part of a product | Art. 102 IPL | industrial designs | novelty of an industrial design | Polish Act on Industrial Property Law | Polish courts | Polish law | Voivodeship Administrative Court.